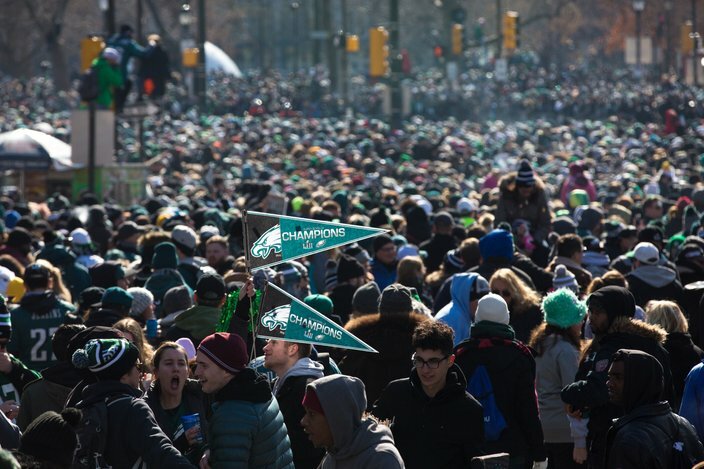 A city official on Friday morning disputed a Daily News report that the Eagles parade was attended by 700,000 fans. Dan Bradley, emergency operations director, said Philadelphia officials believe the crowd was larger than that figure, but lower than the higher numbers circulating on social media. But he declined to put a number on it. "I think it's a moving target, but we do feel its likely higher than 700,000 people," Bradley said. Gaining an accurate crowd count can be difficult based on various factors, including the time and the movement of individuals throughout the parade route. City officials "focus entirely on safety and security and operations," Bradley said, leaving them with "very little time" to conduct accurate crowd counts. "For us, really the measure of success is not the number of folks who attend, but the quality of the experience that we provided," Bradley said. Police Commissioner Richard Ross, for his part, said more people attended the Eagles parade than the Phillies World Series parade in October 2008. Ross said he saw the crowds at both events. "I'm not comfortable adding up numbers, but I can tell you there were clearly more people there yesterday," Ross said. "I walked from that Parkway scene all the way to the stadiums and back. There were a number of people everywhere." Mayor Jim Kenney had a different take. “I think we had more people than the Trump inauguration,” Kenney cracked. With the region transitioning back to work, Kenney and city and Eagles officials offered a debriefing on one of the city's most-attended events in history. Throngs of fans lined the parade route – dozens deep near City Hall and along the Benjamin Franklin Parkway – as they soaked up a moment they waited more than five decades to enjoy. “It was a special day and a special parade that will be remembered for a very long time,” Kenney said. Eagles fans will be talking about the team's first Super Bowl parade – not to mention Jason Kelce's speech – for decades. In many ways, Kelce stole the show, hopping off of the parade floats to interact with fans in South Philadelphia, all while wearing a Mummers outfit. "I used to wear a costume like that every year," said Kenney, a former Mummer. "I couldn't believe he had it on, but I got it used to it. He is who he is – and we love him." Kelce and other players jumped off the floats caused the parade to slow its advance through South Philly. But Fred Stein, one of the event's planners, said it made the day more memorable. "A couple of the players decided it's not enough to be on top of the great big bus," Stein said. "They had to get out and greet the crowd. That's where the fun began. It made it so much the better. In our minds, it didn't delay it as much as make it that much more exciting." 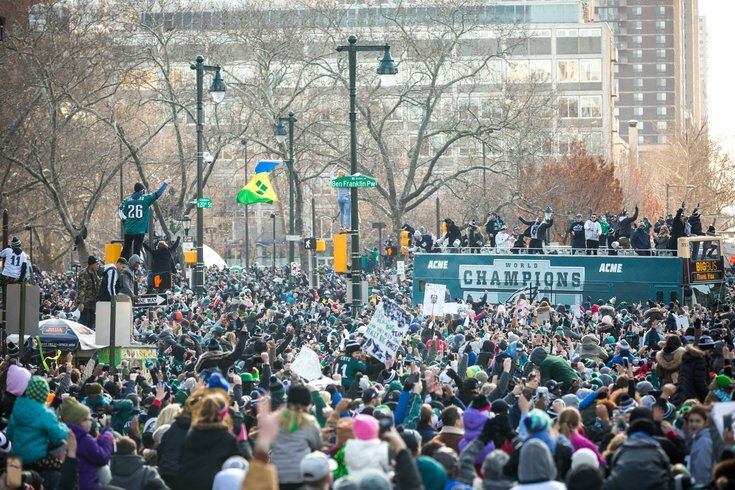 Fans packed in to watch the Eagles championship parade, Thursday, Feb. 8, 2018. Throughout the parade and its aftermath, police made two arrests and wrote five disorderly conduct citations, Ross said. One woman who allegedly assaulted an officer after rushing into the parade route in South Philadelphia was taken into custody. Another man was arrested after an alleged assault on another civilian. Additionally, Ross said there were two stabbings. A 25-year-old man was stabbed around 22nd Street and the Parkway after he engaged in a fight. No one has been arrested. The second stabbing occurred inside Liberty Place in Center City, but police do not necessarily believe it was related to the parade. Four police cars parked along the parade route sustained minor damages when fans hopped on them to get a better vantage point, Ross said. Fans also climbed and toppled one of the Jumbotrons along the parade route. That prompted police to transport a busload of police officers to the site, with the bus obscuring the viewpoint for some fans. The Jumbotron likely will costs tens of thousands of dollars to repair, Stein said. Emergency personnel made about 200 patient contacts and 54 medical transports along the parade route, Fire Commissioner Adam Thiel said. Overall, city officials deemed the parade a major success and considered the total number of police incidents minor, given the sheer number of people who attended the celebration. "The way (police) perform is outstanding," Ross said. "The way they interact with crowds, and most importantly, the way they use restraint and discretion, is critical. You're dealing super-sized crowds. "To be able to have that type of event, with those numbers, and to have ... some small hiccups is remarkable in my estimation." The celebration left quite a mess along the parade route, with confetti, beer cans and other trash littering the streets. But as the parade moved northbound, the streets department began sweeping up the debris, according to Streets Commissioner Carlton Williams. Street cleaning on the Parkway – probably the most dirtiest area – began around 6 p.m. Thursday and continues in the area of Eakins Oval, where the Eagles gathered to deliver speeches to the massive crowd. The Parkway was opened in time for the morning rush, Williams said. Cleaning operations next will go into the neighborhoods where there was parade overflow. Fans cheer on the Philadelphia Eagles during the championship parade, Thursday, Feb. 8, 2018. And why fans and experts may debate the crowd total, SEPTA provided some raw numbers. SEPTA carried 395,000 riders – for free – on its Broad Street and Market-Frankford lines, said Scott Sauer, SEPTA assistant general manager of operations. Additionally, the transit authority had the capacity to transport about 70,000 fans via Regional Rail – and the required pre-purchased passes sold out within 24 hours. A medical situation at Jefferson Station in the evening caused some delays for Regional Rail passengers going home, he added. Prior to the parade, some fans grumbled that they could not park at the stadium complex in South Philly and take the Broad Street Line to Center City. But the city decided to shut down those lots because it would have required stationing 300 police officers there for tailgating purposes, Kenney said. "I know it was inconvenient for some people and I apologize for that," Kenney said. "Three-hundred officers is a healthy contigent. We have to control traffic. We have to police the lots themselves." The city lost 4G cell service for some periods, despite efforts to bolster cell phone service, Bradley said. It was particularly difficult to maintain signal strength along South Broad Street, which he characterized as an "urban canyon." "The dynamics of how people use people use cell phones is changing," Bradley said. "We saw that at the papal visit. Everyone wants to live stream now." 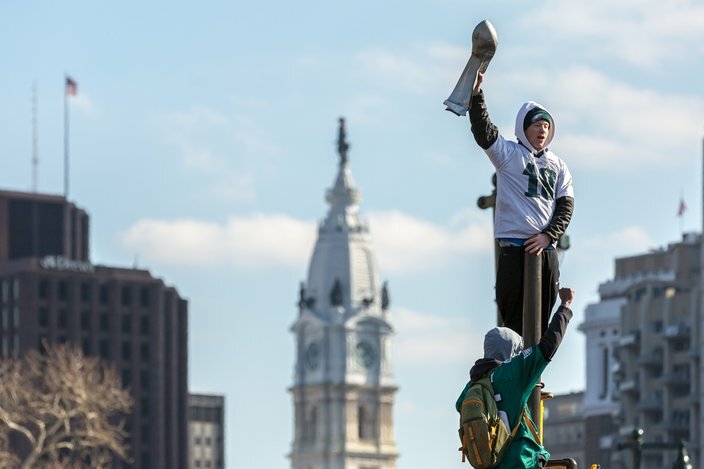 But the fans also wanted to cheer on the players as they traveled from Lincoln Financial Field to the steps of the Philadelphia Museum of Art. Don Smolenski, president of Philadelphia Eagles, noted the “fourth down roar” that was omnipresent all the way up the parade route. “I think yesterday was a great illustration why sports is more than a game,” Smolenski said. Meanwhile, as Kelce's spirited speech lingers in the ears of Philadelphians, the city and the Eagles are meeting to debate some numbers that extend beyond the parade attendance. Mainly, officials must determine the cost of the massive event and who will cover which portions of it. Officials said no agreements about who covers specific costs was made beforehand, and it will take 10 days to two weeks to determine the total parade cost.